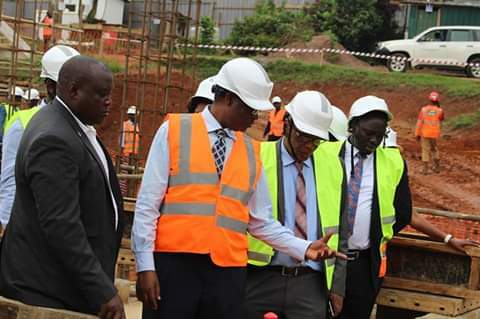 KAMPALA– Members of Parliament on the Natural Resources committee led by its chairman, Dr. Kephas Sempange, have lauded the National Water and Sewerage Corporation (NWSC) for speeding up the construction of Katosi Water Treatment plant. The MPs made the remarks on Thursday as they toured the plant. The tour started with a visit to the contractors’ yard where the Director Engineering services, Eng. Alex Gisagara together with Eng. Johnson Amayo and Eng. Denis Talemwa conducted presentations on the entire project scope. The committee then visited the reservoir site and then concluded the field tour at the site of the booster pump in Namugongo-Sonde. The MPs urged the corporation to keep up with the fantastic work it’s doing in providing clean safe water to the citizens of Uganda especially with the implementation of SCAP 100. The new plant which will initially produce 160 million litres of water per day will have a design capacity of 240 million litres of water per day. The plant is being constructed by Sogea/Suez International. The additional 160 million litres of water from the Katosi plant will serve the growing drinking water needs of Kampala Metropolitan up to 2040. The current daily supply of water from Ggaba Water Works is 240 million litres. The additional 160 million litres of water per day will take the total drinking water volumes for Kampala Water service area to 400 million litres per day. Kampala Water serves Kampala, Wakiso and Mukono. The works to being undertaken include the 240 million litre capacity offshore water intake,160 million capacity drinking water treatment plant, 10 million litre capacity reservoir on Nsumba Hill and construction 10km bulk water transmission pipeline of 1400 millimeter diameter. The project design is being undertaken for 6 months from the date of contract June– December 2018. Construction work will last 24 months and started January 9th. Supply Project. The Bugolobi and Arua projects are substantially complete. The Mbale Water Supply will start soon. The project which will cost Euros 82,213,231 will be funded by the Government of Uganda, the European Investment Bank, The German Funding Agency KfW, The French Funding Agency AfD, and the EU Africa Infrastructure Trust Fund. NWSC is committed to 100% service coverage, infrastructure expansion, increased geographical coverage, water quality and customer delight.